one day Boojho was eagerly waiting to meet his grandparents who were coming to the town after a year. He was in a real hurry as he wanted to receive them at the bus-stop. He ran fast and reached the bus-stop in a few minutes. He was breathing rapidly. His grandmother asked him why he was breathing so fast. Boojho told her that he came running all the way. But the question got stuck in his mind. He wondered why running makes a person breathe faster. The answer to Boojhoís question lies in understanding why we breathe. 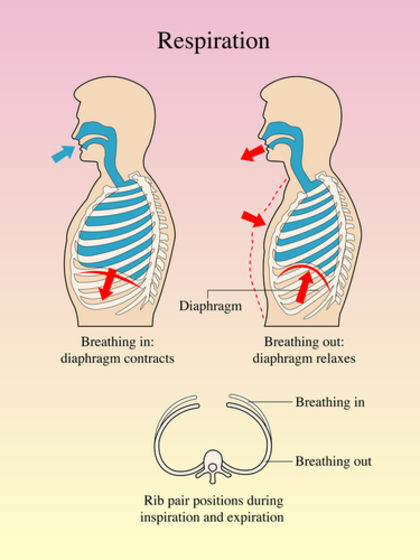 Breathing is a part of respiration. Let us learn about respiration. we have learnt that all organisms are made of smallmicroscopic units called cells. A cell is the smallest structural and functional unit of an organism. Each cell of an organism performs certain functions such as nutrition, transport, excretion and reproduction. To perform these functions, the cell needs energy. Evenwhen we are eating, sleeping or reading we require energy. But, where does this energy come from? Can you say why your parents insist that you should eat regularly? The food has stored energy, which is released during respiration.Therefore, all living organisms respire to get energy from food. During breathing, we breathe in air. You know that air contains oxygen. We breathe out air which is rich in carbon dioxide. The air we breathe in is transported to all parts of the body and ultimately to each cell. In the cells, oxygen in the air helps in the breakdown of food. The process of breakdown of food in the cell with the release of energy is called cellular respiration. Cellular respiration takes place in the cells of all organisms. In the cell, the food (glucose) is broken down into carbon dioxide and water using oxygen. When breakdown of glucose occurs with the use of oxygen it is called aerobic respiration. Food can also be broken down, without using oxygen. This is called anaerobic respiration. Breakdown of food releases energy. Have you ever wondered why you get muscle cramps after heavy exercise? The cramps occur when muscle cells respire anaerobically. The partial breakdown of glucose produces lactic acid. The accumulation of lactic acid causes muscle cramps. We get relief from cramps after a hot water bath or a massage. Can you guess why it is so? Hot water bath or massage improves circulation of blood. As a result, the supply of oxygen to the muscle cells increases. The increase in the supply of oxygen results in the complete breakdown of lactic acid into carbon dioxide and water. Respiration is essential for survival of living organisms. It releases energy from the food. The oxygen we inhale is used to breakdown glucose into carbon dioxide and water. Energy is released in the process. The breakdown of glucose occurs in the cells of an organism (cellular respiration). If the food is broken down with the use of oxygen, it is called aerobic respiration. If the breakdown occurs without the use of oxygen, the respiration is called anaerobic respiration. 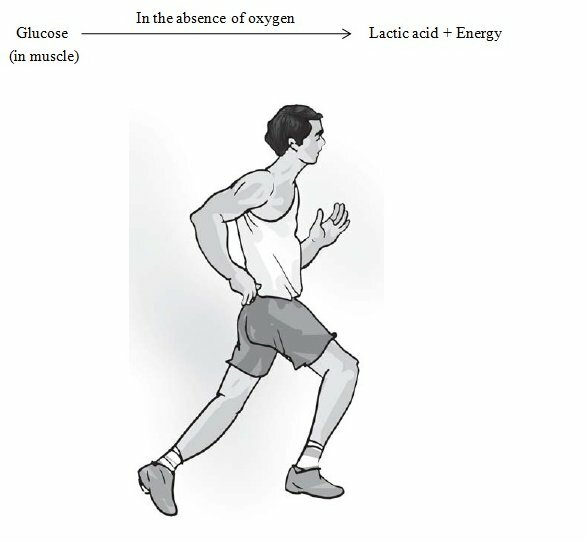 During heavy exercise when the supply of oxygen to our muscle cells is insufficient, food breakdown is by anaerobic respiration.